Our team recently donated the graphic design, seo and internet marketing in Fort Lauderdale for this Memorial Day Weekend, Food for the Poor Fundraiser. The event will be held on Memorial Day Weekend near Ft. Lauderdale beach, right on A1A & Las Olas Blvd in a beautiful new building. The Las Olas Beach Club. In addition, we are helping provide Florida search engine marketing and social media optimization support for any sponsors and volunteers. If you are interested in donating, please visit the Food For the Poor link above or call the phone number on the flyer. Help raise funds for housing 300 people/60 families in Nicaragua. 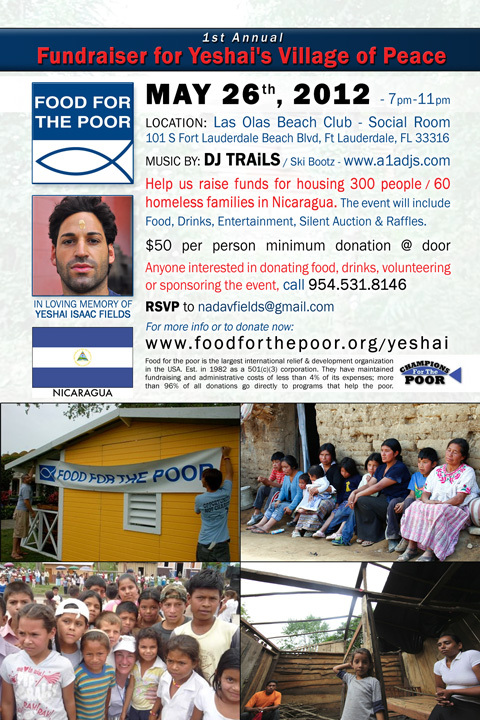 www.foodforthepoor.org/yeshai The event will have food, drinks & entertainment. $50 per person minimum donation at door. Please RSVP *Anyone interested in donating food, drinks, volunteering or sponsoring the event, message or call us. IN CELEBRATION OF NADAV & YESHAI’s 30th Birthday. PLEASE SHARE & INVITE ALL YOUR FRIENDS & FAMILY IN LOVING MEMORY OF YESHAI ISAAC FIELDS. In Chichigalpa, Nicaragua there is a small community of homeless families currently living in extreme poverty which most of us cannot even begin to comprehend. Amongst this impoverished community, you will find 60 families that need our help. These people seek refuge where they can sleep free of garbage, rodents, and disease. Our goal is to raise $38,400 (12 homes x $3,200/home). The organization has found donors that will not only match the 12 homes, but will also build each home to a larger specification. This means that the $38,400 we raise, will create 24 double sized homes, accommodating 300 plus people, many of them relatives. Our mission is to develop a self sustaining village by providing these beautiful people with electricity, water wells, livestock, crops, and a medical clinic. Homes will be built simultaneously, and in 3-4 months time we will cut the ribbon to a new beginning, “Yeshai’s Village of Peace.” We chose FOOD FOR THE POOR because 94% of the funds go directly to those in need.